I’m so glad they are getting along. Plenty of one way flights to Moscow if they so choose. I'd be weary of flying on Aeroflot though unless you're insured. It's now the Russublican Party. The days when the Republicans cared about democracy are now over. It's now Trump's version of American, which is starting to look a lot like the Russian dictatorship where the media is the enemy and whatever the leader says must be accepted without questioning. This where we say "America: Love it or leave it? We are all still waiting for the so-called celebrities and far-left extremists who claimed that they would leave the country if Donald Trump was elected to actually do what they said. Please let us know when you find out... I'm just dying to hear! This wasn’t a joke thread. I truly believe this is Muleman and Goober, flocking to their happy place, to escape the pressures of having to deal with evolution. Imagine their truck ride back home, all sad and depressed just like a couple coming back from their honeymoon. Donald Trump won the election and the Russians had no effect on the outcome. Any thread that mentions mule and goob is a joke. 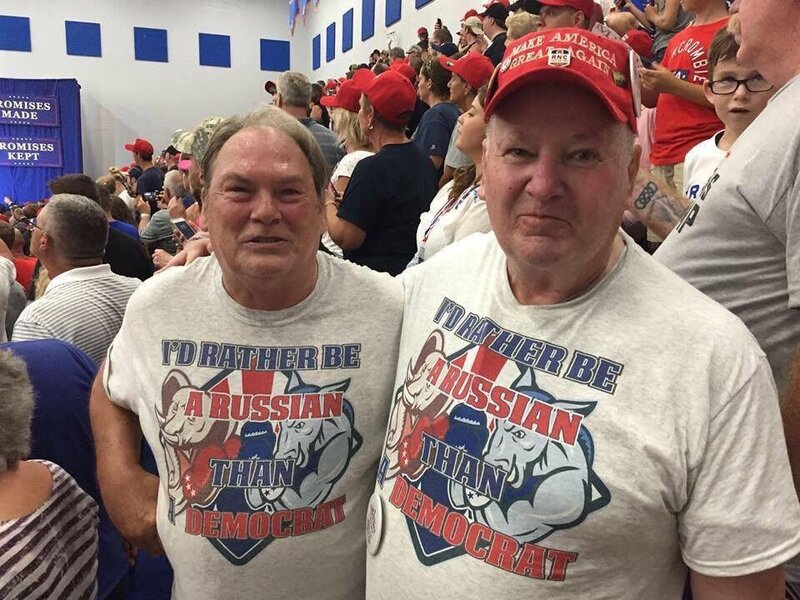 So muleski, would you rather be Russian than Democrat? It is much more fun to be in America. Yesterday's special elections make it all worth it. For the last month all we have heard from the lefties and the corrupt liberal media is that yesterday's special elections would be the beginning of the "blue wave", Trump's downfall, and the Democrats taking back the House. President Trump and the Republicans wiped the floor with the Democrats and every one President Trump endorsed won. - This was a moral victory for the Democrats. - The people are standing up to Trump. - The Democrats could pick up 60 seats in November. Yes boys and girls, the corrupt liberal media has lost it. Everyone that Trump endorsed won. You do realize that those wins were in primaries with the exception of the Ohio Congressional special election. The Republican candidate will win by less than 1% in a district that Trump carried by 11.4%. That isn't exactly "wiping the floor". And how did the GOP "wipe the floor" in GOP primaries? Was anyone expecting a Democrat to win a GOP primary? Make 'em Mexican border patrollers--Right next to Muledouche (unless he's up at the Canadian border)!!!!! Comrade muleturd has never been the sharpest knife in the drawer. Two races are still too close to call. MAGA now means Make **** s Go Away...the 'like Goober and Mulehead' is silent (and understood!!!)! Keller is right. If we take a look at the special elections that have taken place since Russian Don has taken office one thing is a constant - the percentages he won by is significantly lower for GOP candidates in special elections and / or the Democrats have flipped the seat. Last night in Ohio the GOP candidate barely held a district held by the GOP since the '80's. Listen to what GOP Governor Kaisch has said about the GOP holding seats. This November the GOP candidates will be facing many elections in districts won by Trump with far less than the 11.4% like last night. The November elections will represent a statement about Trump, his family, his swamp, his cozy love affair with Putin, and his racist tendencies. The Republicans won and the Democrats lost. Bernie will be the next president of these here United States. President Trump has a net plus and again yesterday the Republicans won and the Democrats lost. All this talk about Venezuela's crisis makes you wonder, is the problem that it's socialist? Or is it that it is a corrupt dictatorship, supported by Russia, with state run media and a president that criticises any free media as fake news? Hmmm. Seems like the socialist countries in Scandinavia and Canada are doing very well for themselves. Pretty sure none of their presidents criticise the media on a daily basis, and none are in bed with Putin. Mule desperately needs the pat on the back that his daddy never gave him. Good job Mule! You won! You were the best of them all! So proud of you. People caring about which party “won” and “lost” is so sad and silly, as if it’s some personal victory. so here is something to think about or not. 1) is that really the mule dude and G? it helps to put a face to the names. "meddle" or try to mess with the election. 3) however, i don't think the interference changed the outcome of the election. had the president said something like that at the start, perhaps his administration wouldn't be having so many issues. im sorry one more. why when the pres uses statistics, does he believe the ones that support him. the ones that dont support him he doesn't believe. the insults, the fighting, the lies. does none of this bother some of you? The black guy is gone, nothing else matters. Donald Trump won but us Libs want him gone, nothing else matters. Obama didn’t need a circle of underlings getting “the Russian governments support” for his election like Trump did. Somebody calls you out for “wanting the black man gone”, and you don’t even deny it in your above response, and somehow compare it to liberals and Trump. Way to show ‘em!